Very true. I'm not too concerned in reality as I've recently been comparing turbo speed for steady state intervals of varying power over the last 5-6 months, and everything points at it being consistent (typically within 1% of the speed for matching power). Alas my plan for a local 10 tonight has been scuppered, mild chest infection at the moment I think, so have stopped training. Think I'm on the mend so hoping to ease back into it tomorrow to hopefully be in some sort of form for Saturday's BDCA 25. Bother. But the only point was as a benchmark, so no point doing it if 1) you aren't up to scratch 2) the weather is too awful to make for a reasonable comparison. I shall have to curb my excitement until Saturday. Interesting ride this evening... I'd almost be tempted to describe it as a small breakthrough. After the failed stem test on the previous page I wondered if I could see the faintest hint of an advantage in the longer stem (105mm, -10º) so I kept it on for this evening's TT. Today's course was the U95/10, a course I don't really like and it was cold with a strong cross wind so hardly ideal conditions, however I ended up setting a course PB of 23:47. Ignoring questions about power meter accuracy, and focussing entirely on my relative placing I think I made a pretty big improvement. The man behind me (and the winner today) caught me and beat me by 1:17, but beat me by 2:12 last week, also I almost caught my minute man who beat me by 12 seconds last week... in both cases a relative improvement of about a minute. Overall I finished 6th/21 only 30 seconds behind the usual fast guys. 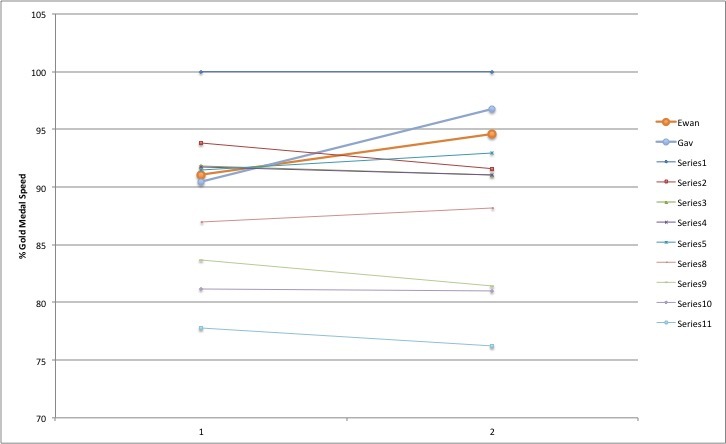 The chart shows the % of gold medal speed for all riders who raced both events, relative to the the fastest rider. 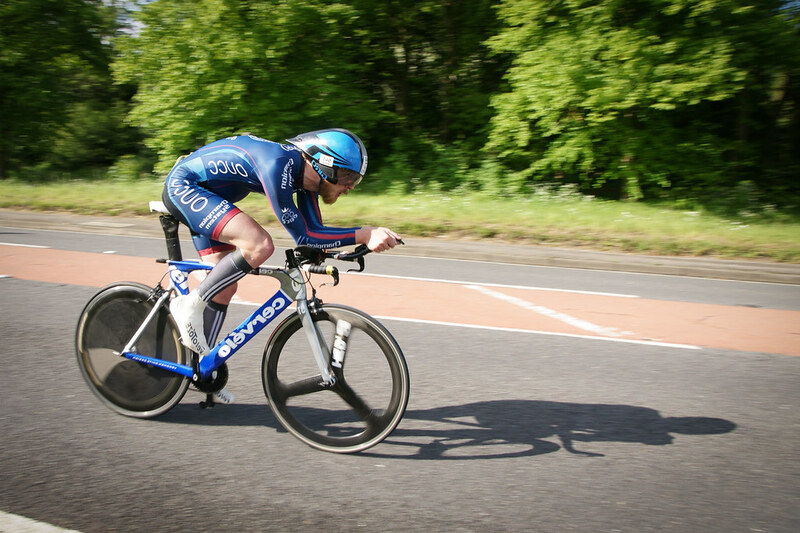 Only one rider showed a better improvement than me was a guy called Gav, and I suspect that his first race was a dud (they hold the club record for 10miles: 19:58 set in Hull last year). Oh, and regarding the power meter data... I was assiduous about doing the correct install procedure today. Although there was still a slight power imbalance (52% vs 54%). Great improvement! Have you done a Strava compare to see where you lost/gained time against the others? That might give you a clue as to whether it was an overall/aerodynamic improvement, or perhaps better pacing? Edit: I checked out the comparison between the fastest 4 from this week - you're currently top so the faster ones haven't uploaded (or didn't match the segment). Only one of the ones below you was close, and it seems to be an overall improvement rather than significantly different pacing. I don't have starve premium so the compare feature doesn't really work properly for me, so thanks! I did have a quick look at strava and as you say none of the fast folk seem to upload data. 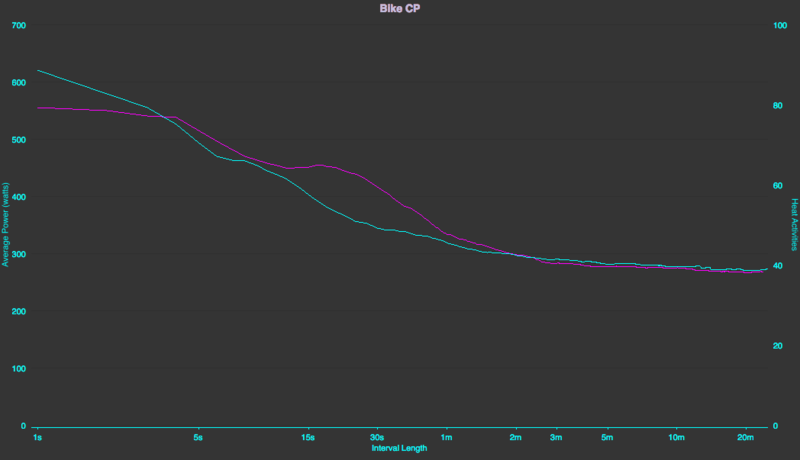 Still, my power data suggests I paced it pretty well and rode more or less exactly to plan. 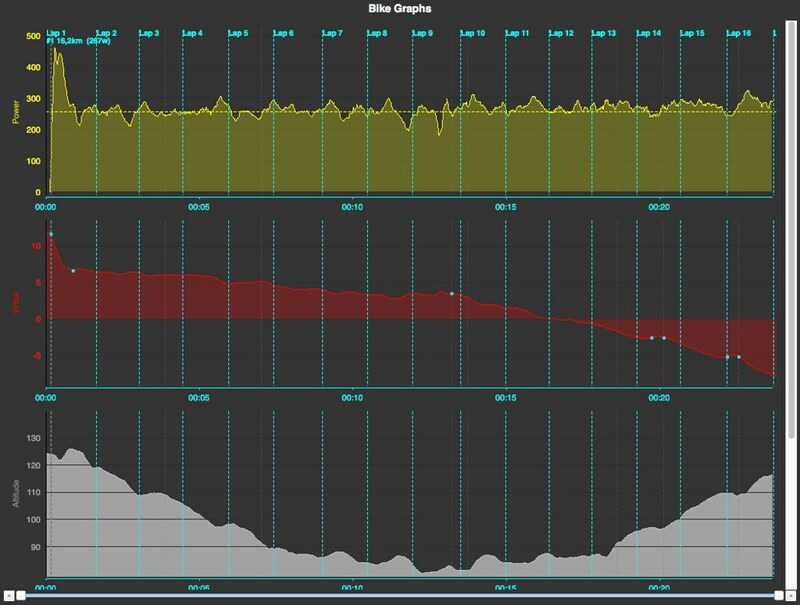 The bottom chart shows how the entire 2nd half of the course is a solid drag uphill and in the past I've gone too hard on the outward leg and blown on the return. Yesterday I wanted to keep both halves pretty consistent but I wanted to have enough left in the tank at the turn that I could negative split the power on the way home. The W'bal chart illustrates this really well, and the dotted line on the power chart represents my current estimated FTP (257w). Errr... So there is the possibility that I might have the opportunity to run a c.50mile ultra in mid May... The only thing is, it's only 4 weeks away, and I've not really done any training this year. Seriously tempted, but worried it might be a bit much? Thoughts: There's nothing you can do that is conventionally useful. So it's all about the fact that your body has had experience of doing these things before... i.e. you know something about pacing and nutrition and exhaustion and your body knows what to do to get across the line. If Mick can do the MdS, you can almost certainly do this. You might not be first across the line though. During aero coach we tested multiple helmets (Wasp/Javelin/Selector/Advantage and 'eyeballed' a Bambino but didn't test it), a few saddle positions, slightly raised hands, and worked on my 'tuck'. The selector was the fastest hat, my saddle position was about right but we raised it 5mm, Xav wondered about moving my saddle back but we decided to keep it forwards for running off the bike. For the raised hands position we simuated riding with J-bend extensions which was faster and more comfortable, but overall the biggest single difference was to work on my tuck. This includes a new helmet and fractionally raised saddle. I've clearly not mastered the tuck and I've not yet replaced my extensions (which would be a faff because it would require re-cabling the whole bike). Over the past few months I've been doing some playing on my own... So far I've tried a longer stem (big improvement), lowering the bars (I've not been able to detect a difference in testing yet, but I suspect that that is largely down to wind on my test run. I'm currently keeping the original position but plan to test more). 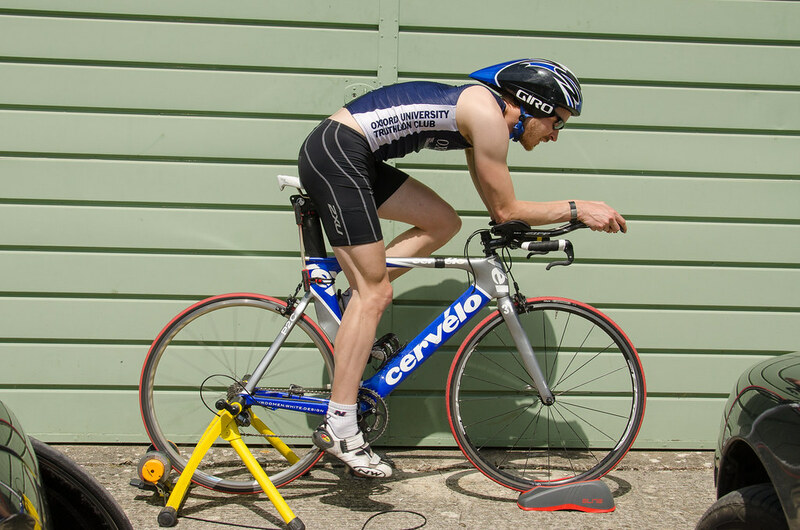 I've changed to J-bend bars (I've not tested these myself but the aerocoach session suggested they would be faster and they are so much more comfortable that I don't care). I'm also running shorter carnks (175 ->170mm), and have upgraded to a 1x10 drivetrain with DA rear mech and TT front ring. I've had a couple of chain drop problems so put the FD back on (un cabled) for the ski slope on Sunday but for regular courses I shouldn't need it. my CP60 is 30w down on 2014, and my CP20 is 45w down (2015 was similar to 2014 but slightly lower). This is entirely down to a lack of training but the new changes mean that I'm setting course PBs left right and centre.